I’m writing this down here and now so you all can bother me in the future if I renege: I will never try to make a social deduction game. The Resistance was one of the first modern games I played and I fell in love. I’ve played over 100 games easily and I’ve analyzed it from every angle. I think it’s a fantastic feat of design and the epitome of elegance. It boils down the social deduction genre to its necessary elements and adds nothing else. It’s pure suspense, psychology, and tension. To build a new social deduction game, then, requires either taking The Resistance and adding to it, which could work (Secret Hitler is good), but is necessarily less elegant, or fundamentally changing the presuppositions we have about the genre. Get Adler! Deduction Card Game is neither paradigm shifting nor spiced up enough to compete with the top games in the genre, but there is some fun contained in its light card play. GA!DCD is played essentially in two phases. In the first three rounds of the game participants will be asking questions of others, trying to deduce their identity. Depending on the number of players in the game there are one or more villains, and when a question mark card is played that person can ask someone else a yes/no question about one of the four visual characteristics of their characters (highlighted on a very useful player reference card). Investigators have to answer truthfully and villains can lie. That’s the deduction aspect of the game, and I haven’t found it particularly exciting. In all of the games I’ve played at least one of the investigators has been able to deductively prove who one of the villains is by the time round 4 rolls around, and that part of the game is up. See, in most social deduction games there’s an intermediary phase where some people know information, other people don’t, and accusations are thrown around and tested. With Adler, once someone throws an arrest card, if the guess is correct everyone immediately reveals their secret role. It drains a lot of tension from the proceedings when there is more than one villain and it takes away a lot of potential intrigue that other, better games retain. Other cards in the game have modest purposes in the deduction phase. Villains must retain a secret document until the end of the game to achieve their win condition, so discarding one can signal to others that you’re on the side of justice. A magnifying glass lets you peek at the hand of cards of another player, which I’ve found can be helpful if you’re a villain because you can scope out how dangerous someone might be in the latter half of the game. As an investigator it’s not particularly useful because with a hand of 7 cards there’s not a whole lot someone can do with a maximum of three rounds to fine-tune their hand. Perhaps it would be telling if someone is holding onto a secret document when they had previously discarded a more useful card, but I’ve never seen that happen. Once an arrest attempt is successful and all of the roles are revealed, Adler turns into a sort of take that game of cat and mouse that’s marginally more successful than the deduction phase. See, whenever a villain is confronted with an arrest card, they have to run away or start a shootout. 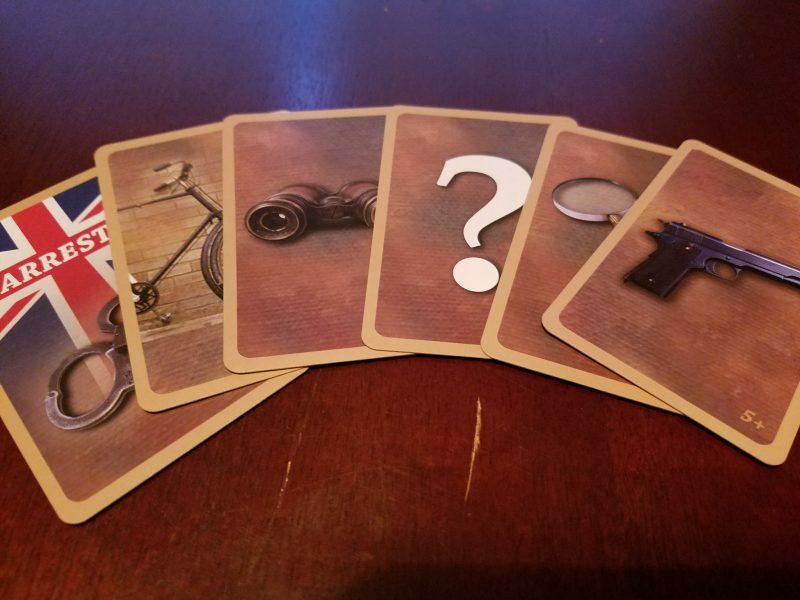 If they run away using one of London’s various methods of transportation (boat, bus, bicycle, etc), one of the investigators must pursue the chase by matching that card. If they do the villain must play another. Repeat until they’ve been caught or escape. Alternatively, if the villain plays a gun card, there’s a shootout and whoever is able to play more guns kills the other, removing them from the game. The villain can also use a disguise or a bomb to insta-escape, though these two cards are very rare. A moderate amount of suspense is generated in these showdowns, and I’ve had some hilarious moments like the one time our villain turned out to be holding a giant stockpile of guns and murdered nearly every investigator. That’s the kind of enjoyment you’re going to get here–not any strategic depth but humor in seeing how the cards play themselves out and how that dastardly Adler manages to escape yet again. It’s paper thin card tossing but I think Adler softens the “take that” edge a bit by designating teams within the parameters of the game. The problem so often with take that games is that they quickly go meta. Siblings target each other for petty annoyance and that new couple that can’t stop looking at each other frustratingly create a soft team much to the chagrin of everyone else at the table. On one of our podcasts I speculated that co-op games can get away with being more challenging because losing together doesn’t sting as much as losing alone. I think take that games work better with teams for similar reasons. Ultimately, though, there’s not a ton of interesting strategic game here. You can make some clever plays, like scoping out player’s hands to see who you might be able to kill as a villain, or trying to snipe secret documents from the villains using the binoculars so they can’t win even if they do survive. But most of the plays will be somewhat obvious, and figuring out who the villain is won’t be a monumental task. Capturing them is mostly up to the luck of the draw, and since the game is only a maximum of 7 rounds there’s not much you can do to try to effectively stack your hand. As an investigator you usually get one good crack at a chase before your hand refills with the same mix of useful and completely useless cards you started with. Still, the narrative situations that play out with the cards are appropriate and amusing, and I can see this being enjoyable for families or people who want something quick, tidy, and without much thought involved. Where the game stumbles the most, however, is with its ban on accusations. I suspect it’s there for balancing reasons, because the deduction part of the game is simple enough as it is, but there is a ban on “communicating by words of gestures between the players as to who someone might be, what cards someone might have, or what to do next…However, some banter is allowed!” The banter concession is more or less useless since you’re strictly forbidden from trying to communicate any useful information other than through the course of play, and in my games this rule has essentially created a hush on the game that is more bored than tense. The best parts of any social deduction game are the accusations, defenses, and bluffs. I have no idea why a game would deliberately try to remove that. It shortens the game to a brisk 15-20 minutes but it also removes its soul. 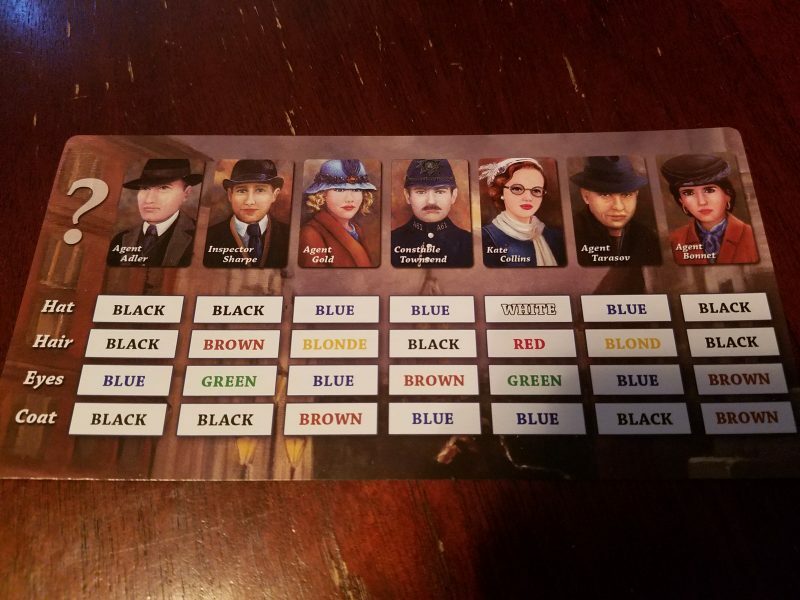 Adler is tagged as a deduction game and while there is some deducing to be had, I think it’ll appeal more to people who want to laugh and shout as bullets fly and men in fedoras escape on bicycles. Think Bang! that doesn’t outstay its welcome rather than a poor man’s Resistance. Love your reviews, genuinely more ‘thoughtful’ than pretty much everyone else. Given your shared loved for Mage Knight (my #1 personally) I’m wondering if you have any plans to look at other ‘epic’ scope/scale games like Mistfall, Food chain magnate, or even good ol’ Arkham Horror. Cheers for your great work! Thanks! I really appreciate the comment. I’ll definitely continue to be reviewing larger games, as I tend to prefer them. They just take longer to get to because of the time commitment. I have actually reviewed Food Chain Magnate already (love it) — http://thethoughtfulgamer.com/2017/03/30/food-chain-magnate-first-impression/. I don’t know if I’ll play Mistfall, though if I happened upon an opportunity I would. I’ll get to a review of Eldritch Horror eventually, though it’ll probably be quite negative 🙂 Heavier games I’ll probably review within the next couple months: Hunt for the Ring, Here I Stand, Twilight Imperium 4th Edition, and Nations. Ah, don’t know how I missed the FCM review! Will check it out! Looking forward to those other reviews too, keep up the fantastic work!